High quality shoes require high quality care. As master cobblers and shoe lovers we believe that this care can only be achieved by using the finest maintenance products. 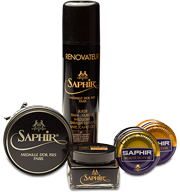 This is why we offer a wide range of products by Saphir, a renowned brand that uses only the finest natural ingredients such turpentine essence, beeswax and mink oil.